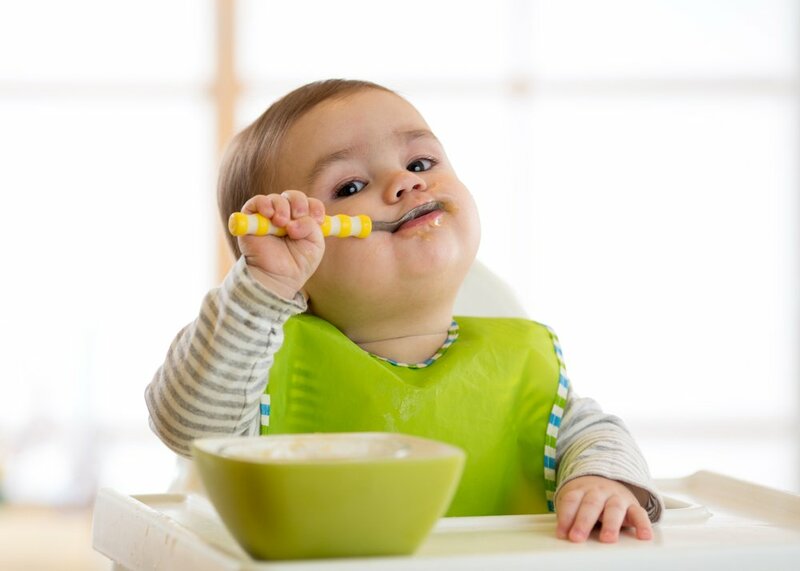 At around 18 months your child will be able to use utensils and drinking cups during meal times. However, before he reaches this stage, at 7-8 months he’ll start using his fingers to grab his food; this is where the fun begins. Let’s take a look at how these next months will look like! Your little one will be excited to eat just about anything you put in front of him. Get ready, because these months will be as messy and smelly as they can get. Don’t worry if, at the beginning, he starts “playing with the food”; this is him experimenting his independence and control. Remember that during this time he’s all about imitating your expressions and simple actions, so, instead of getting alarmed, teach him with your example how to do it. It might be inconvenient to let him explore his food every time he eats but try to reserve some time for doing just that every chance you have. This way he’ll start learning to eat by himself. At around 10 months your son will learn to grasp objects with just his thumb and index finger. So, even if there are spills, drops, or mess, try to keep in mind that he’s cementing muscle strength and coordination into his memory. He’s also learning how to use gestures to ask for help while also exploring by himself. Try to give him space to experiment and learn, but reassure him that you are there to help him if he struggles. At around 12 months he’ll begin to understand how to use several objects for their intended use, including a cup for drinking water. This is part of his growing independence so keep introducing him to the use of different child-safe utensils. Even if he still doesn’t know how to use them on his own, he’ll keep learning. Try to offer him 2-3 snacks a day so that he doesn’t arrive starving to the next meal. It’s also helpful to teach him a structured-sit down snack time as opposed to letting him continue playing while eating. Offer him foods that can be picked up and chewed, that are soft to swallow, and avoid foods that are common choking hazards such as nuts or grapes. During this time, he’ll know how to use an object after he sees you using it. To stimulate his independence and sense of autonomy keep teaching him how to use different utensils. Of course, he’ll be more excited to use his hands, and this is okay too; as long as he does it in a well-behaved manner. The important part is that he keeps learning how to feed himself independently and eventually use utensils the proper way. Be flexible with food acceptance as toddlers are often reluctant to try new things. If your little one refuses a food, don’t make a big deal out of it, simply try again in a few days or weeks. Make sure to use unbreakables as he may throw food or plates around when he’s bored or dislikes something. If this happens make sure to let him know this is an unwanted behavior. At around 15 months he’ll control the movement to bring food into his mouth. He’ll be able to fill his spoon and get it to his mouth consistently. If you are using forks, make sure they have dull prongs. Be patient, although he has more control over the utensils, they will occasionally tip the wrong way and spill the food at the last second. Make it easy for him and cut everything to a bite size. Let him know he’s doing okay and help him continue to grow his hand coordination abilities, self-care, and independence. Around this time, the spills will finally come to an end. Your child will be able to use a spoon, a fork, and a cup during meal times. However, there will still be times when he’d rather finger paint with his soup or turn his plate into a magic carpet; watch out! Don’t use dessert as a reward and try foods that are easy for him to manage such as scrambled eggs or soft cooked vegetables. Keep him seated during meal times to foster his self-regulation and always supervise when he’s eating. Keep it interactive and fun by pointing and naming the different types of food and colors. Remember he’s learning new words, so use the time to talk and connect with your family. As he learns new words and gestures, he’ll be able to express when he’s hungry or full, as well as his preferences. Keep in mind that every child develops at his own pace and has a unique personality. While some children are messy eaters, others might get upset when their food spills or they get a little smudge on their hands. Keep practicing and his independence, hand coordination, language, and dexterity skills will thrive. You’ll also see how this reflects on his self-care abilities when getting dressed. Check out this article to learn about tips and tricks for picky eaters!